Simon’s use of the Segway on set and location has been ground breaking. 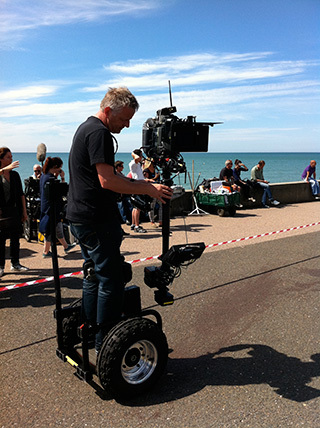 As the first Steadicam operator in the UK to own and operate a custom built Segway mount, or ‘handsfree transporter’, he showed others what could be achieved with this innovative piece of kit. The Segway Steadicam mount provides the operator with a small footprint tracking platform that he / she fully controls. It’s a dolly without tracks wherever you want it and wherever you need it most. It quickly creates dynamic tracking shots but is equally capable of producing a seamless perspective change – even a static shot is possible. It is small, powerful, and versatile, and has a top travelling speed of 12 mph. It can be used inside and out, and we have a variety of wheels / tyre combinations to match most conditions. We have used it across fields and pathways, shopping centres and stately homes, golf courses and small studios. The Segway mount is both cost effective and impressive, and never fails to raise a smile on any sized production. The Segway allows the operator to hard-mount the Steadicam or AR Omega Revolution. This means a huge reduction in operator fatigue, thus allowing infinitely longer takes and the ability to carry both the Steadicam rig and the AR Omega Revolution over greater distances. Step on and off the Segway is possible with the aid of a grip.